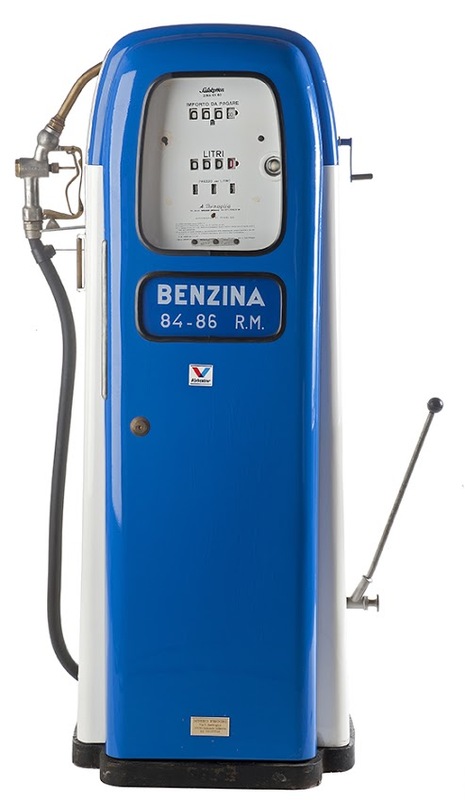 ne day in the early Sixties, in the course of my daily duties, I chanced upon an old five liter, double-vessel Bergomi gasoline pump, abandoned in a sand quarry, in pitiable condition” writes Guido Fisogni, a man too smart to acknowledge the beauty of Petroliana, fuelled with stunning examples of vintage type. The man behind the over the top Fisogni Museum of the Petrol Station in Tradate, in the province of Varese, which is home to over 5,000 pieces of industrial archaeology coming from every corner of the world as long as it is fuelled, sure knew that this treasure of retro beauty is destined to impress. 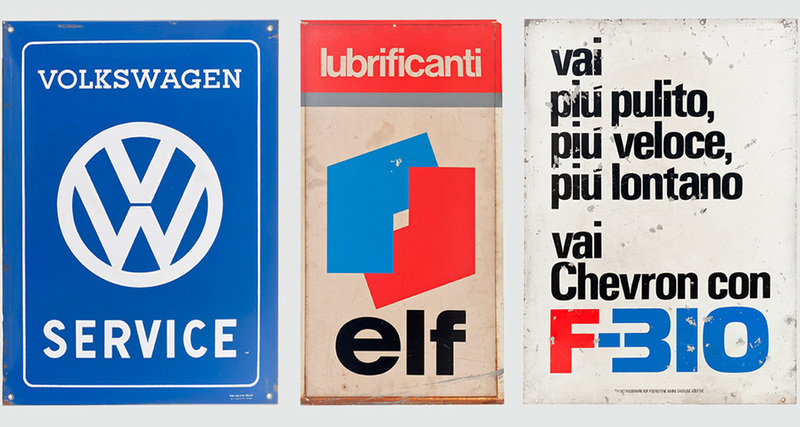 From gas pumps through compressors, fire extinguishers, oil cans, oil tin cans to posters and license plates everything fits into place in the museum, created by Fisogni in 1966. “I decided immediately to recuperate and restore it, and since that moment more than thirty years ago, work and hobby now intermingled, I have been able to put together a collection which the experts of industrial art judge to be unique and particularly rich” he comments. “Now that the rather haphazardly assembled collection has been organised and properly structured, I can take the time to formally thank Alfredo Cattaneo, who helped me in my researches, and Giuseppe Croce who, more concretely, executed the restoration work. And here I would allow myself some observations. 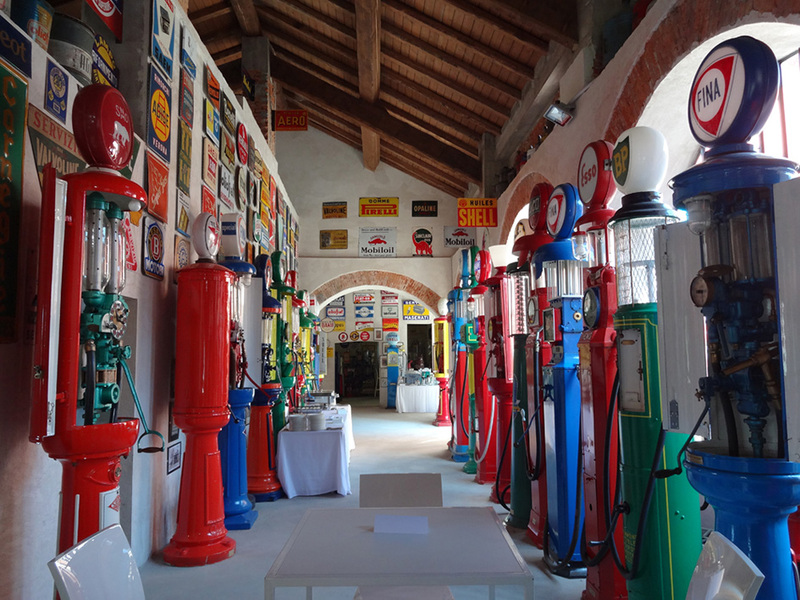 The signs, the gasoline cans, the globes, the toys and the other objects which form the supporting cast for the true stars of the museum – the pumps themselves – do not serve merely as pleasing aesthetic appendages to the industrial arts, but are important witnesses to the rapidity of change. Industrial production, by its nature, quickly consumes its own products in order to make way for newer, more beautiful, more efficient ones. To recuperate the past; to document the history of technical improvements; to confer, among other things, an aesthetic dignity often unacknowledged as a result of a prejudice against the serial production of industrial objects – these have been the objectives of the past thirty years of impassioned research, and they remain as such even now that the disposition of the collection in a museum context allows a much clearer historical and aesthetic reading of the collection as a whole, and of the individual objects of which it is constituted”. With Triennale Design Museum Milano and Mille Miglia Museum part of its collaborators, the museum which was located inside Palazzolo Milanese until April 2015, when its new headquarters in a beautifully renovated villa near Varese was inaugurated, is a trip to a global graphic design awesomeness. In case you are (rather wrongfully) wondering why would a museum fuelled of vintage signs and type is worth visiting, here is a thing or two on the importance of branding through the industrial revolution. “Since the end of the 19th century the petrol station has achieved more and more importance. The prominent technological evolution required refuelling system always more automated and safe. In less than a century, the petrol station has developed into a fundamental item for every day life. 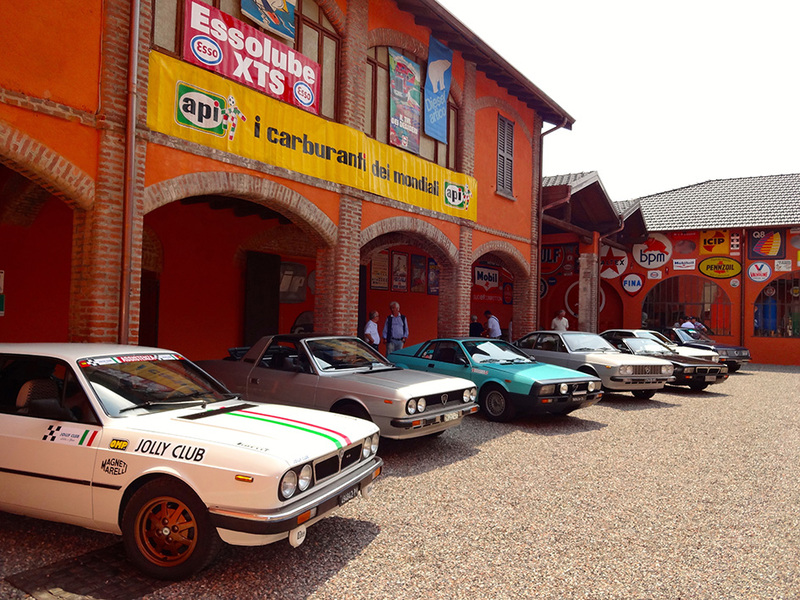 Fisogni Museum of the Petrol Stations, rather unique in its type, including more than 5000 pieces of industrial archaeology collected by Guido Fisogni. 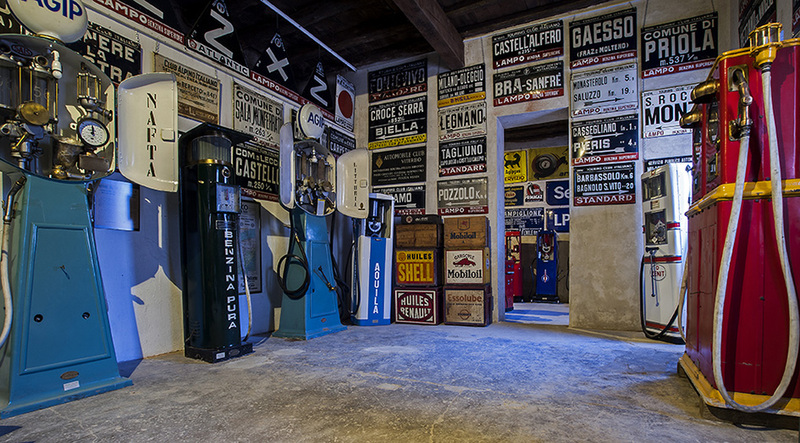 The collection doesn’t number only the petrol pumps but also everything concerning petrol stations: globes, containers, advertising boards for roads and locations, air compressors, fire extinguishers, tools, gadgets, toys and photographs. With the visible pumps being the protagonists of the Twenties, a decade in which the progress of motorization and of fuel distribution forged strongly ahead and the gasoline pump a part of the urban, filled with signs and letters, landscape, great companies began to see that they could improve their corporate image by improving and unifying the look of their outlets through type and this is how it all began, in a very fast and furious mode. My eyes opened up to what he could see when I stumbled upon a newly published book called ‘Benzina’. It had pictures of gas stations, oil tin cans, signs, and globes (those glass, and later plastic things that used to be on gas pumps like lampposts, colourful and round, with Amoco, Esso, or Gulf written on them: hustlers for randy tanks). The Museum is so out of this world that it even inspired author Alessandro Baricco to write a short story titled “Benzinaio da grande”, published in the collection “Barnum” (Feltrinelli, Milan 1995). “In every classroom, there was always one kid who wanted to work at a gas station when he grew up. A gas station? A gas station. How silly, you thought. But you were wrong. That kid was a poet, and in a way none of us could grasp, he was less silly than any of us. He was someone who, while still in his childish short pants, was able to smell the perfume of a legend. He could see it where we only saw a gas station, the stink of petrol, and dirty hands. He could see the legend. My eyes opened up to what he could see when I stumbled upon a newly published book called ‘Benzina’. It had pictures of gas stations, oil tin cans, signs, and globes (those glass, and later plastic things that used to be on gas pumps like lampposts, colorful and round, with Amoco, Esso, or Gulf written on them: hustlers for randy tanks). Oh, we are sure gearing up for “Petroliana”, join the ride.